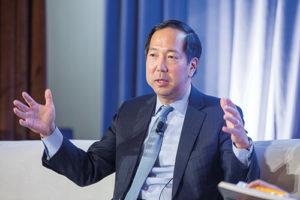 As chief financial officer of the world’s largest alternatives asset manager, Michael Chae knows a thing or two about managing the operations of a complex and growing organisation. In January, he shared his insights with delegates at the CFOs & COOs Forum 2019 in New York. Here are the highlights. How do you think about innovation and growth into new business lines at Blackstone? It really begins and ends with investment performance. All your best thinking about growth and line extensions not only won’t matter but they’ll be a distraction if you’re not performing in your businesses. Moreover, there’s this virtuous circle of investment performance making the investor world – your LPs – happy, who will then support you as you innovate and think about new solutions and strategies that are natural extensions of your capabilities, and also satisfy their ever-growing investment needs. The firm is looking to move further into growth investing. Can you talk about the decision to enter the life sciences space? Stepping back, what we look for are spaces and areas where there’s a big capital need and the opportunity to build a big, scale business. The biotech asset class has been around [for] a long time, [but] the revolution in life sciences from a science standpoint over the next 10 to 15 years is going to be as big or bigger than the last 10 to 15 years. At the same time, as a private asset class it’s still underdeveloped from a scale standpoint. Some of the biggest LPs, our LPs, really are thirsty for more exposure to it. They find it hard to get because it generally comes with niche firms at a smaller scale. Those two combinations really excited us. We acquired [life sciences investment firm] Clarus, and we’re going to keep building capabilities around it. We think there’s a great opportunity to build a larger ‘multi-strategy’ platform in the life sciences space writ large. Blackstone just hired Jon Korngold from General Atlantic to head up a growth equity investing platform. Had you been investing in this space from other Blackstone businesses? We’ve recently been doing it out of our Tactical Opportunities business, which has a very flexible capital platform. We’re going to take that to another level with Jon and build a dedicated growth equity investing business. It’s synergistic with many of our existing businesses, and in turn, that capability he brings, with others on the team, will be a great overlay on other businesses as well, starting with private equity. What’s your advice for CFOs whose firms are exploring new strategies? A big part of what a CFO can do is help quantify how much this [new strategy will] move the needle. What is the real financial contribution and impact of this new idea to the firm long term? Can it really scale? That is important not only in moving the needle for the firm financially, but also because scale and building something bigger is aligned with being able to attract great people and having a large enough pie that can create [their] rewards for people. It also justifies the right focus and attention from a management time standpoint. You want to make sure as a CFO, as an operator, that all of the hidden costs – maybe not hidden to you but hidden to other folks – of creating something new are understood, all of the potential for adding operational complexity are understood, and that that’s taken into account from a financial planning and operational planning point of view. If you were the CFO of a lower mid-market firm with limited resources and technology budget, what would you prioritise? People. Attracting talent, and retaining them, and finding them in what I call a hot labour market – which often lags the actual market – is a real challenge. A firm like that obviously won’t have unlimited resources to create an infrastructure, [so] looking at third-party alternatives, outsourcing, is natural. We have a big technology organisation, we invest a lot in it. Part of the benefit of our scale is we can do that. But we’re always looking at [whether] it’s a “make” or “buy” decision in some critical areas of applications and processes. We’ve internally developed some solutions that just aren’t available for alternative assets because it’s an immature market. How do you measure success of the firm’s investment in technology? I think technology is, in a lot of ways, the most challenging piece for all of us. In the context of an investment firm, attracting technology talent in New York City or anywhere else is very challenging. In terms of measuring benefits, a lot of the business people in your firm think those metrics are easy to come by and provide to them, but they’re not always easy to produce in the short term. So you basically need to make great judgements about what’s essential to run the firm, and what can really move the dial in terms of improving the firm, investing, meeting investors’ needs better and so on. You need to have confidence in making a judgment around what you think is right for your firm even if you can’t produce simple ROIs that say it’s going to be worthwhile. What’s your view on how and when the private equity industry may be disrupted? There’s some talk about how artificial intelligence or technology writ large could disrupt the model, whether it’s around identifying investment opportunities or, on the other hand, raising capital [for investments]. I think it will be evolutionary, not revolutionary, around tools like that. I think for the most part it might change or evolve how existing players do their business. I don’t see in the near term a wholesale dislocation or disruption to the business like it might the traditional liquid investing world. I think in the continuum of asset management [control-oriented illiquid strategies like private equity are] probably the least “disruptable”. Does private equity still offer investors value for money? Of course the answer is yes. [The performance data over the long term] continues to show that, net of all fees, it is delivering value to investors relative to public market alternatives. At our firm, over 30 years or so, in our private equity business and our real estate business and others, we’ve basically returned 15 percent-type net returns – net of all fees, that’s what matters to investors – and, relative to public markets, that’s been approximately double public market performance over long periods of time. I also think as we enter a possibly more challenging environment, we are in a very different place than we were in 2008, 2009, 2010. I think a lot of firms have shown the ability of their portfolios and their funds to weather downturns. From a qualitative standpoint, I think many private equity firms are really well-constructed, have great value creation and management capabilities. So in the grand scheme of [investment] portfolios, you have a barbell: [on the one end] public investments, [where investors are increasingly] focusing on passive investing, lower fees; and at the other end of the barbell, illiquid investments. I think LPs think the fees are justified relative to the active management and value creation and performance that has been delivered over a long period of time.